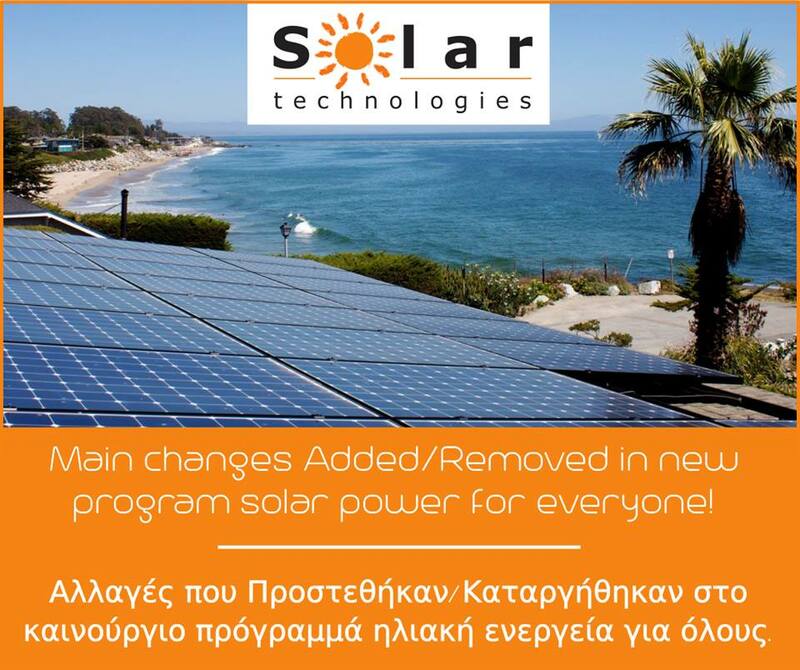 Main changes Added/Removed at the new funding " new program solar power for everyone"! Main changes Added/Removed at the new funding " new program solar power for everyone"! Added: 1. Photovoltaics for farmers have now been integrated in the new program 2. Autonomous Photovoltaics have now been integrated in the program 3. The application fee for expanding net-metering from 3-5kw €150 + VAT and without the need of presenting documents that do not change, such as title deeds, building license etc. 4. A new and simplified application form Removed: 1. Technoeconomic analysis 2. Electrical Plan 3. Installer Statement of Responsibility 4. Permanent residence 5. Information of the installation contractor with details of employees.